Not everyone likes the Windows 7 desktop, which is why there are loads of options – in Windows and through third-party apps – that allow you to make changes from the tiniest of tweaks to the most radical of makeovers. 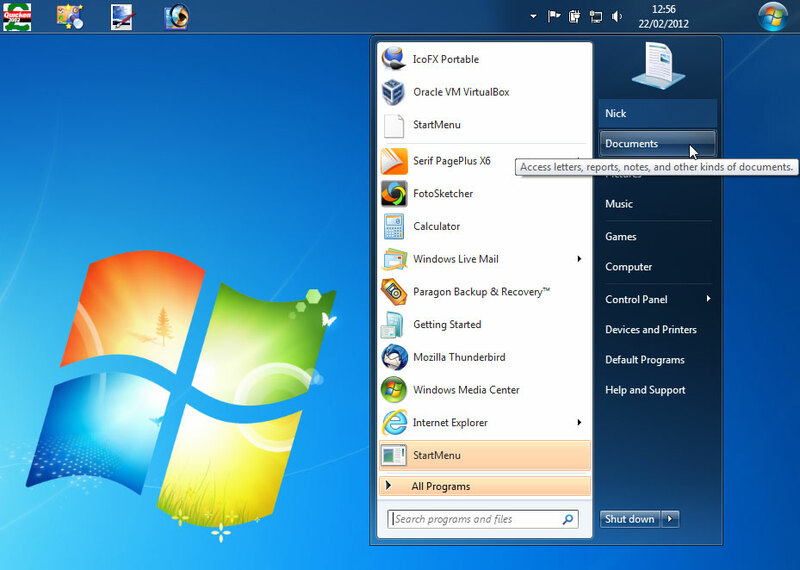 One thing tends to remain, however: the position of the Start menu. Even if you move the Taskbar to another edge of the screen (unlock it, then simply drag and drop it into position), you’ll find the Start button always appears on the left or at the top of the screen. For most people, this is sufficient, but if you’re one of those who’d like to move the Start button, then Start Orb Mover is the app for you. Once downloaded, open SOM.zip and drag the Start Orb Mover folder somewhere convenient, like a portable apps folder. Then open it up and double-click StartOrbMover to get started. After clicking Yes, you’ll be prompted that the file has been downloaded from the internet – make sure you untick the “Always ask before opening this file” box before clicking Run, otherwise you’ll run into problems. After a short pause, you’ll see the Start button appear in the middle of your Taskbar – click this and the Start menu appears next to it. Unfortunately, it appears underneath the Taskbar, making parts of it inaccessible. It doesn’t do this when the Taskbar is moved to a different edge of the screen, but that may not be in keeping with what you wish to achieve. You can move the button to the right of the Taskbar, or access various other tools, by right-clicking the Start button itself. Here you’ll find a number of useful options in addition to those that control the app (under Settings). You can open the Taskbar properties, launch an administrative command prompt or start, stop or restart Explorer. In theory, this is a clever app, and a godsend for those who want to move the Start button somewhere else, but in practice it’s still not bug-free. We were unable to close the app using the “Restore Default & Exit” button – it closed the app, but the tool for restoring the Start button didn’t function correctly the first few times (resolve this by manually opening the AppFiles folder inside Start Orb Mover folder and double-clicking Showit, then unticking the “Always ask…” box before clicking Run). The Start menu also appeared too low when the Taskbar is placed at the bottom of the screen on our test machine, but did position itself correctly when the Taskbar was placed at the top. Despite these glitches, the beauty of Smart Orb Mover is that it's portable and won't do any lasting damage to your system, even when it throws up a bug or two. Just reboot your PC and all will be as it was before. It’s an interesting concept, but Start Orb Mover 1.0 is a little too flaky for our tastes - nice idea, still some way to go with the execution.